Terry Mayo is at the TPub booth, #1606. Emerald City Comic Con provides so many opportunities to meet exciting talent. Case in point is Terry Mayo. 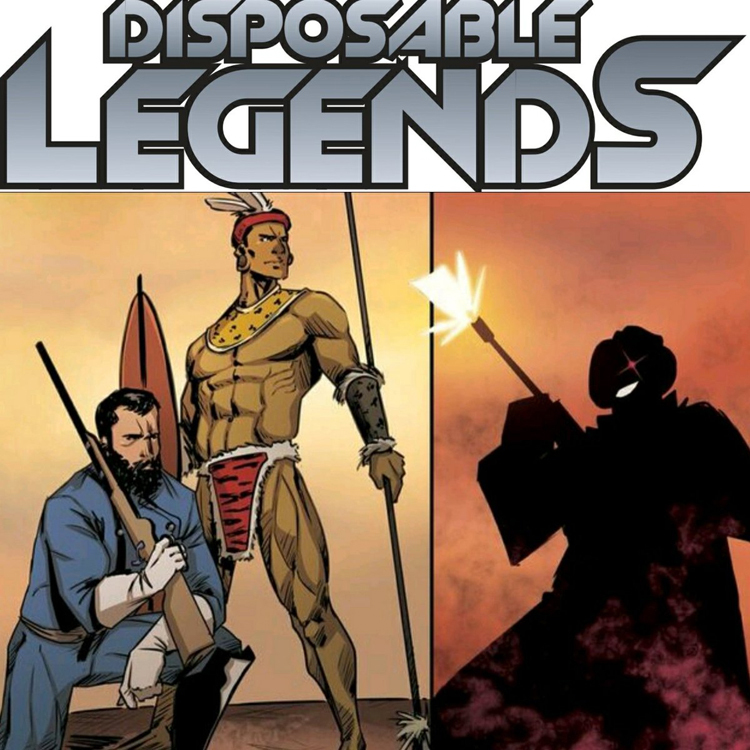 He is currently on tour in support of his comic book, THE WICKED RIGHTEOUS with Alterna Comics; and his upcoming comic book, DISPOSABLE LEGENDS, with TPub Comics. 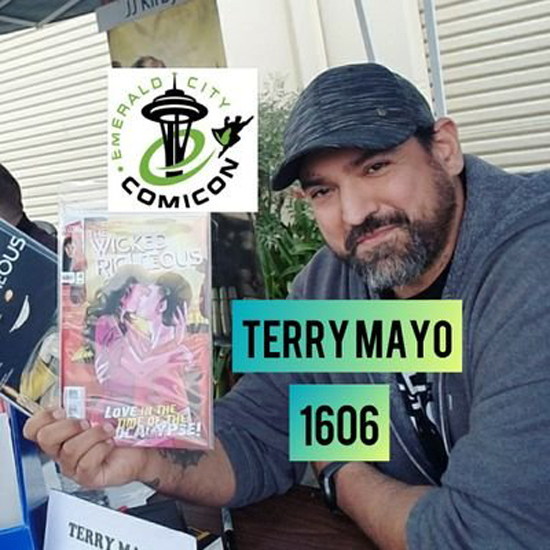 If you’re going to ECCC, find Terry Mayo at the TPub booth, #1606. The TPub booth features all sorts of goodies, like the ongoing series TWISTED DARK. 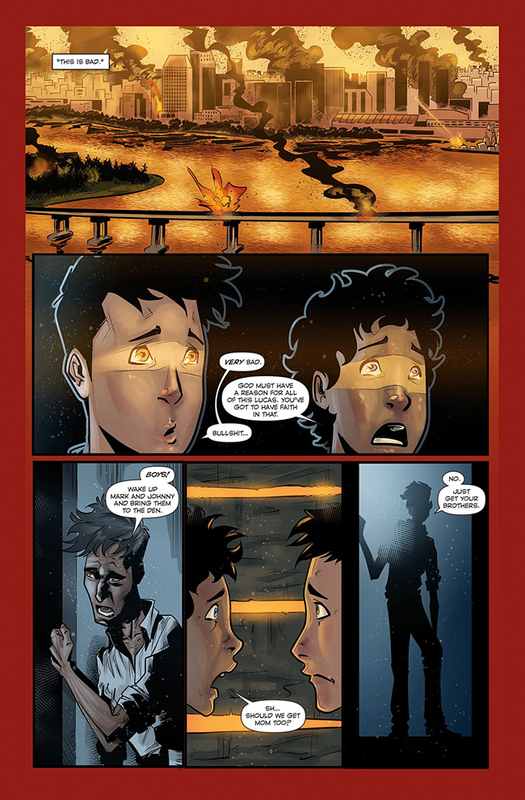 THE WICKED RIGHTEOUS #1 is a post-apocalyptic 6-issue comic book series from Alterna Comics. The creator and writer, Terry Mayo, describes it as “Mad Max meets Stranger Things.” We are midway through the series at this point so I’m catching up here. I can report that the first issue definitely sets the tone and proves to be a most enjoyable read. When the Apocalypse hits, it comes down to survival of the fittest. Mayo plays with that concept with fine results. Think of this as having a bit of a Walking Dead vibe to with the focus being on one family clan in an alternate San Diego set in the future. You’ve got sophisticated government drones constantly hovering around and monitoring citizen activity. You’ve got a population that has been devastated by a mysterious plague. And you’ve got a civilization that is a mix of high tech and a throwback to another time more in tune with primal animal instincts. What’s so great about going to cons is stumbling upon little gems like this comic. I am always on the lookout for something that has just the right quirky offbeat factor. If something is just a historical saga, for instance, it becomes a much harder sell for me to be convinced I should take the time and effort to say anything about it. In the first place, where is my motivation? If a creator is a bit of a prima donna, again, I need a reason to overlook that. The list goes on. My time is valuable and so is yours. With that said, I like what Terry Mayo is doing here. I will start to wrap this up by just emphasizing how essential it is to have some sort of hook in a work of comics. I don’t know how some readers are attracted to some of the stuff that for me, and for more careful readers, looks like it has been stripped of any shred of humanity. My hunch is that most readers are sometimes willing to take something for what it is and then just move on. What I think a comics publisher like Alterna Comics does best is to keep to a core of authenticity. I kid you not, people sniff that out. 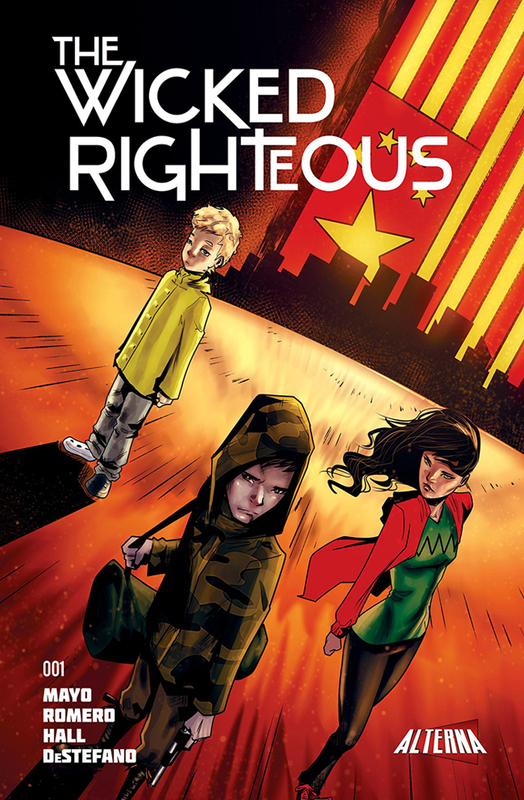 Overall, I look forward to seeing the collected trade to THE WICKED RIGHTEOUS. I think the whole creative team here should be proud of themselves. The artwork by Lucas Romero definitely has got a real deal human touch and goes a long way into getting the reader involved. Colors by Christopher Hall are spot on with the moody atmospherics. Lettering by Brandon DeStefano fits in exceptionally well into compositions and enhances the genuine and organic feel to this comic. 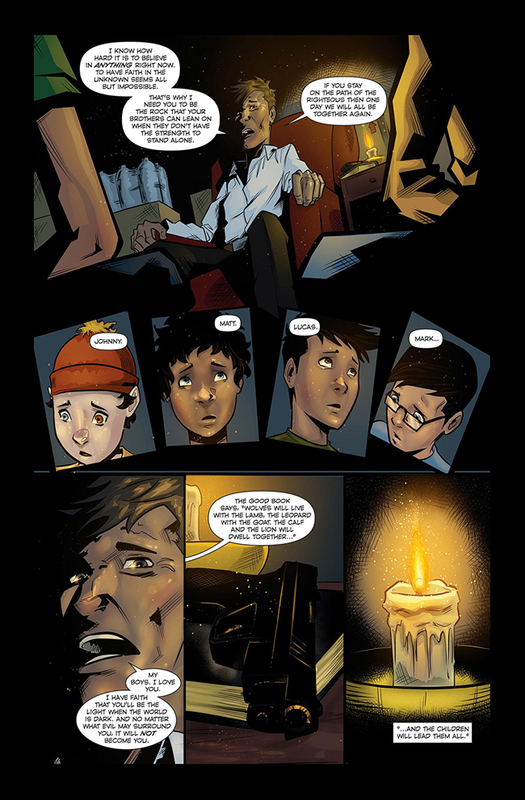 THE WICKED RIGHTEOUS is available at comiXology right here. For more details, visit Alterna Comics right here.